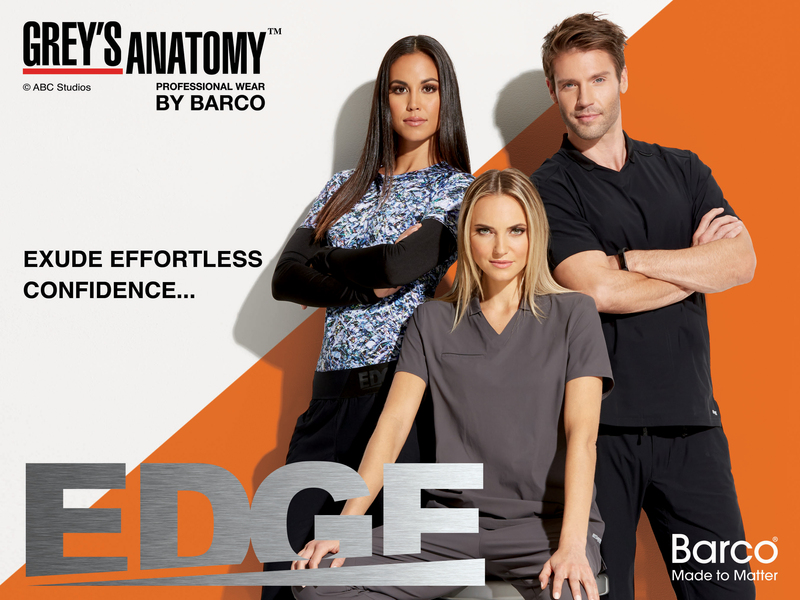 LOS ANGELES, April 3, 2019 /PRNewswire/ -- Barco® Uniforms, a recognized leader of design innovation in the premium healthcare apparel industry, today announced the launch of Grey's Anatomy™ EDGE, an extension of the globally popular Grey's Anatomy scrub collection. EDGE features Barco's proprietary, patented 'super fabric,' Nylex™, in a collection consisting of seven pieces designed to meet the unique needs of healthcare professionals, all the while excluding effortless confidence and modern style. EDGE offers healthcare professionals a sophisticated, modern minimalist look to provide a functional, yet elevated look and feel for the wearer. The capsule collection includes both V-neck and collared tops for women, both with versatile 'kangaroo' pockets, a jacket, and two pant options one with a tapered leg and the other with a straight leg to provide a personalized fit. EDGE offers men a V-neck top with 'kangaroo' pockets and pants with an elastic waistband and stylish tapered legs for added comfort, style and flexibility. Each piece within the collection is designed to be breathable and gently contoured to flatter any body shape. "Our foundation as a company is built on product quality and innovation. We have a maniacal focus on three key areas: fabric, fit and performance. We developed this latest proprietary, performance-oriented fabric technology to meet the unique demands of the healthcare profession," said David Murphy, president and CEO of Barco Uniforms. "With all that these professionals do to care for others, we wanted to create a line of professional attire that would enable them to look great and feel confident in their work and lives." For over nine decades, Barco has maintained its position as the leader of meaningful scrub brands that are innovative, modern and relevant. Unlike trendy brands that come and go, Grey's Anatomy is a global brand that millions of healthcare professionals have chosen to wear since the beginning of their careers and they remain loyal. Barco continues to pour passion for modern, relevant design into its scrub brands, keeping consumers coming back for more. The introduction of EDGE expands the Grey's Anatomy brand collection to seven unique sub-brand collections, each of which focuses on the unique, specific needs of its intended professional target consumer. The EDGE line includes four core healthcare colors for men and women: Black, Indigo, Stormy Sky and New Royal. The line is featured as the cover spotlight of Barco's 2019 summer catalogue, which announces its much-awaited April debut. For more information on Barco Uniforms or Barco's Nightingales Foundation visit: www.barcouniforms.com. You can follow the company at www.instagram.com/barco.uniforms/, www.facebook.com/barcouniforms/, https://twitter.com/BarcoUniforms and www.pinterest.com/barcouniforms/.